We got to Wrigley Field and found the lot we had a parking pass for around 10:30am. It was pouring rain by then and the gates did not open until 11:20am. We ended up waiting in the car until almost that time, since we were parked very close to the ticket pick up and the main entrance to Wrigley Field. Once inside we wasted time walking around the main concourse, since it was pouring rain and we were not sure if our seats were in a covered area or not. It turned out they were when we headed up there about an hour before game time. 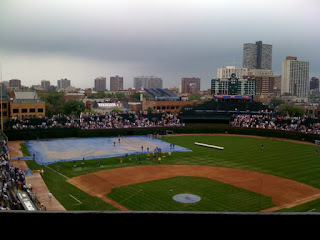 The rain stopped around 1:15pm, which was a little before the game was supposed to start. The ground crew began to get the infield uncovered and get it all lined and ready for the game. They were ready by 2pm, but they decided to wait until 2:45pm to start the game because they thought another rain storm was coming. It was such a pointless and annoying decision because they totally could have played and just called another delay if the rain did show up. That is what they did in Cincinnati. The real annoying part is that supposed next wave of rain never came unless you count the rain that came right after we got back on the road to the apartment. The game was worth waiting for. Game 15 at the Indians' Progressive Field was the best game of the trip at the time, but now Game 16 has topped it as the best of the trip so far. The Indians got a three run homer in the top of the second and another in the top of the third. They then got another run in the fourth to give them a 7-0 lead in the fourth inning. The Cubs began to come back with a home run in the fifth and another in the sixth. They then got within one run by scoring four runs in the bottom of the eighth with the help of five singles and a walk. In the bottom of the ninth Derek Lee tied the game with another homer (he also hit the one in the sixth inning) and to force extra innings. They kept the Indians from scoring in the top of the tenth despite loading the bases. The Cubs then won when Theriot hit a single to bat in Soriano who had gotten on base with a walk when there was already two outs in the bottom of the tenth. Go Cubbies!!! Even Mik is rooting today and excited for the ballgame. When we got to the park the only area open was the concessions near the Heritage Park Hall of Fame in outfield concourse. It did have some good food options, though. Mik got a cheeseburger combo meal. It came with a cheeseburger, waffle fries, and a large souvenir cup drink for $11.25. Mik declared it his favorite meal at a ballpark so far. The great food options, which also in other areas included fried fish and popcorn shrimp with fries and Moose Tracks ice cream and Orange Sorbet helmet sundaes, is part of why Mik declared Progressive Field his favorite ballpark on the trip so far. He was too full to even get around to trying the other things, but he did like that there were plenty of great options to choose from. I have no photo update for the National League side of the car after the Reds game because it has not changed since the Rockies game. We looked at the Team Shop and the stands inside the park, but we were unable to find a Reds sticker for the car. Now both sides of the car are missing a sticker. At least the White Sox one we might fix because we are in Chicago today, but the Reds one will probably just continue to be missing. Being one of the newer ballparks Great American Ballpark is accessible appearance wise, but not very conveniently so. It is much like the annoyance of Petco Park. If you do not know the place well, you can easily go annoying extra long ways to your seat. Parking was not easy or obvious either. Our first annoyance came with parking, as we got there and Dad did not know where to park. I think there is actually parking right next to the park under the Arena, but we did not know about that and no signs made that obvious from the way we got to the ballpark. The first downtown area parking garage we drove into was this really odd one that double parked the cars and said they do not have handicap spots because they are a private parking lot, while at the same time they have a big sign that says public parking. Anyways the next one we came to did have spots, but actually they barely did, as we got the last one. Getting inside the park turned out really easy, as we came through the gift shop after the Reds Hall of Fame. This entrance into the park from the back of the Team Shop has no turnstile to go around, so way easier than any other entrance. However, getting through the shop is not worth it if we had not been souvenir shopping because as usual the shop was hard to navigate the wheelchair through. Our seats were in the Kroger bleachers in left center field and we entered the park on the third base line near the outfield. We saw a map and it made it seem like you can just walk around the back of the outfield and easily get to the elevator to go up to the Kroger bleachers. Well, we get to the outfield and encounter stairs. The usher we asked gives us awfully vague directions to go way to the edge of the outer concourse (i.e. back to the street almost) and then there was a ramp way to go around the back of the outfield. It was not too hard to locate and do, but was annoying to assume the whole concourse was the same level as the mapped seemed to show and arrive and have to go quite a ways out of the way just to get down and around. If they map had made that clear going the other way around the park would actually have been the faster route. Since we had spent so much time in the Hall of Fame we really were looking for the fastest route as we did not have as much time to spare to get to our seats as we usually do. At least there was an accessible route that way and we did soon find the elevator. We did encounter the elevator being full when it got to the level we were on and no one in it was disabled. Two employees were on it and noticed Mik in the wheelchair and got off to take the stairs so we could get on. It was still very squished, but at least the employees did care about wheelchairs getting priority on the elevators, which was more than the usher on the elevator cared about, as that person was ready to close the doors and leave us waiting for the next load. At least it was only because the elevator had been loaded at a previous level and not because people not needing it were trying to load in front of us. The seats in the Kroger bleachers were pretty good. The scoreboard is up behind you, but the way it is lit makes it still very easy to read if you just look over your shoulder. The view of the rest of the park is also pretty good. Only a little of the warning track is blocked. Also, the fireworks stacks are mostly blocked, but you can at least still see the tops were the fireworks go off from for homers and Reds wins and smoke comes out of with every Reds pitcher strikeout. The bar in front of the handicap seats is a little high, but the top bar does angle towards the seats, which makes it a little easier to see over without having to lean forward much. At the Reds game I got a souvenir baseball with a Great American Ballpark image. It is just a simple image of the field, but the logo part is pretty interesting. The other strip is red and has a Reds logo on one side and says Cincinnati Reds on the other.